In the Galleries: Marc Chagall's "Let My People Go" from "The Story of Exodus"
"Let My People Go" by Marc Chagall, 1966. 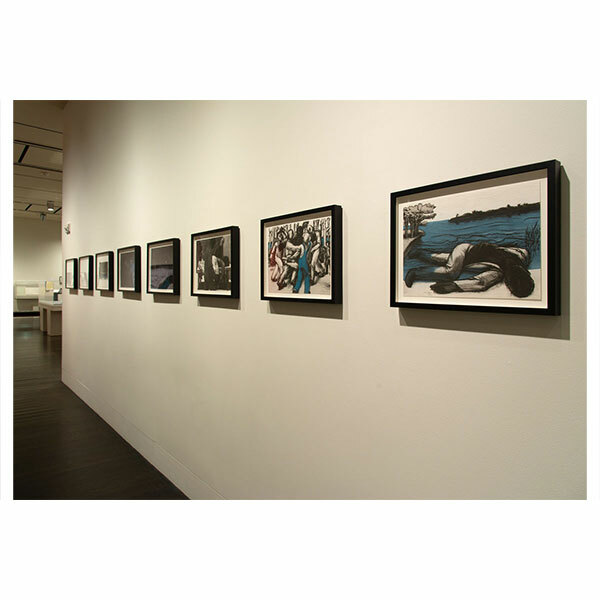 © 2011 Artists Rights Society (ARS), New York/ ADAGP, Paris. From the very beginning of printing, the Bible was regarded as the ultimate challenge. It presented printers and artists with the daunting task of creating an appropriate medium for communicating sacred text. They met this challenge with widely divergent methods. Some favored sharp, clean typography and traditional artistic approaches, placing as little as possible between the reader and the word. Others celebrated the text with elaborate typographical or artistic interpretations of biblical passages. 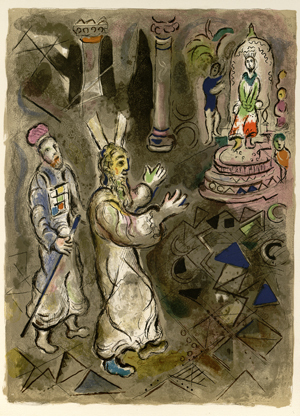 One such example of the latter is this large publication in which the text of Exodus is paired with 24 color lithographs by artist Marc Chagall (1887–1985). The prints show Chagall’s expert use of color and are representative of the lyrical, dream-like scenes for which the artist is known. The Story of Exodus represents a major focus of Chagall’s work, namely Judaic spirituality and Hasidism. One of the great lithographers of modern art, Chagall produced more than 1,000 original lithographs over the course of his career. Fifteen of the 24 prints from The Story of Exodus are on view in the exhibition The King James Bible: Its History and Influence through July 29.